There are millions of people in the United States that are currently under the threat of deportation, especially if the Deferred Action for Childhood Arrivals (DACA) program is terminated at the end of the year. For many people facing deportation, the United States is the only home they’ve known for years, even decades, and in some cases almost their entire lives. The idea of going back to a country they don’t know has led many to take extreme actions. One New Yorker, Amanda Morales, ended up seeking sanctuary inside a Manhattan church in order to avoid deportation orders. ICE agents cannot detain you for deportation while you are at a church, school, or hospital. If Morales was deported, there would be no one to care for her children. The idea of taking sanctuary in a church might seem extreme until you are facing deportation yourself. At that point, you’d be willing to do almost anything in order to keep your job, stay with your family and friends, and maintain the life that you’ve built for yourself. So if you are facing deportation currently or think you might be in the future, it’s important to know what steps you should take in order to protect yourself and better the chances that you can remain in the United States. Don’t panic, don’t run, don’t hide. Deportation is scary. There is no denying it. However, no matter how scary it might be, you’ll need to avoid doing things that could make your situation worse. These include panicking and deciding to go into hiding or run away. Running or hiding from authorities could make your case much, much worse. So while it’s hard to face, you’ll need to do so if you want to increase your chances of successfully fighting the deportation case and remaining in the United States. Gather all of your information. Start preparing for the fight by gathering all of your personal information. This includes taxes, work history, your full legal name as well as any aliases you might have used, and your Alien Registration Number. If you already have a Notice to Appear (NTA), then make sure you keep that on hand, too. This will detail why the government believes it has a right to deport you and may give insight as to the best way to make your case. You need to contact an immigration lawyer as quickly as possible. Our office offers immigration legal services. New York state has also set up a legal defense fund for those facing deportation, so those services may be available to you as well. Wherever you can find professional legal help, get it. Immigration law is tricky and nuanced, and having a professional who can guide you through the process can increase the chance that you get the best outcome for your case. A lawyer may be able to identify a solution that you didn’t know existed and help you file the correct paperwork with the right authorities and on the right timeline. They can help you avoid making costly mistakes. There are ways to stop deportation. Deportation doesn’t happen overnight. There will be a hearing in court in order to determine whether or not the government has a valid case for your deportation. 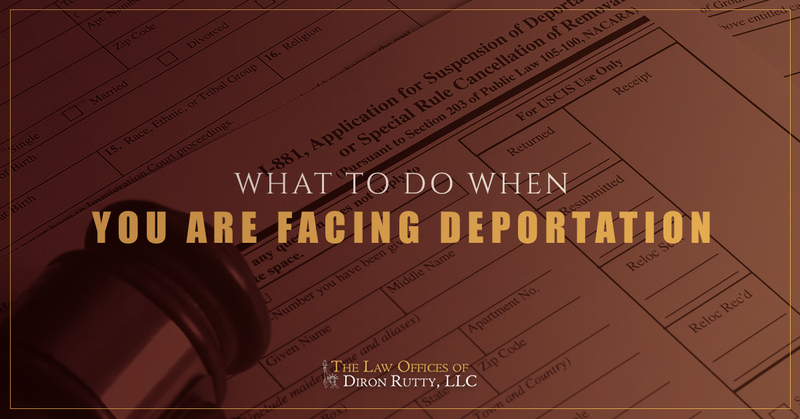 While you are waiting for your hearing, there are a number of things a lawyer can help you do to prevent the deportation from happening or at least slow down the process. These include adjusting your current immigration status, claiming political asylum, gaining temporary protected status, or even filing for the withholding or cancellation of the removal. You may have options that you didn’t even know about, which is why working with experienced immigration professionals can help your case. This is a time to hope for the best and prepare for the worst. It’s a good idea to start making plans for yourself and your family in case the worst happens and your deportation is approved. The upside of deportation cases taking so long to process is that it does give you time to plan for the worst-case scenario. It can give you peace of mind knowing that you have a plan in place and can take action if you need to do so. Are you currently living in New York and facing deportation? Contact the Law Office of Diron Rutty, LLC today. We offer free, confidential consultations on immigration cases. Give us a call or contact us through our website today.